senior citizen assessment , doctors report, rehabilitation for accident . In addition to being a convenience and an enjoyable activity for many people, driving is also a symbol of one's independence. As we age, there are a numerous factors that can affect our driving skills, and hinder our ability to safely operate a motor vehicle. Delaware division of motor vehicle wants older drivers to maintain their driving independence as long as they continue to drive safely and confidently. Delaware drivers of all ages, at the time their current driver license expires, are required to renew their license in person at a local DMV In addition to taking a vision test (see below) which is mandatory for all applicants, you may in certain situations be asked to take a written knowledge test as well. 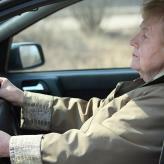 There are no restrictions on senior drivers in New Jersey. In preparation for the test, you can review the Delaware driver's Manuel and take a practice test before going for your license renewal. For any queries, you can call the DMV. All senior drivers in Delaware who renew their license in person will be asked to undergo a basic vision test to ensure they are able to safely operate a motor vehicle. If you wear eyeglasses, be sure to bring them with you to the DMV.In addition, if you haven't had your vision checked recently, or if you believe your eyesight has worsened, we recommend that you make an appointment with your vision specialist before visiting the DMV. The Delaware's vision standard is 20/50 with or without correction. If corrective lenses are required to meet this standard, this would be mentioned on the license. If you do not meet the standard you will be referred to a licensed vision specialist.